Called a chisel hammer by Paul Sellers, when being sold they can be listed as a ‘nylon hammer’, ‘assembly hammer’ or even a ‘soft-faced hammer’. 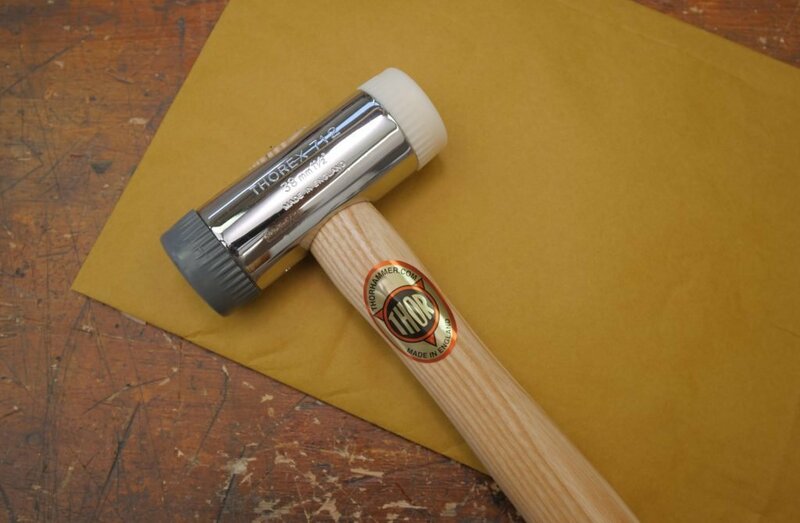 Paul Sellers prefers a nylon faced hammer, (31-712R Thorex Nylon Hammer) his preferred size is is a 1 ½” (38mm). The head of the hammer is made from steel which has a thread on each end to allow you to interchange the heads between rubber, nylon and plastic. If you have a similar model with a nylon handle, Paul sellers recommends shaping this with a spokeshave to make it more comfortable. You can buy replacements head faces for when the heads get damaged/wear down. To view the parts of chisel hammer, click here. We purchased this 31-712R Thorex Nylon Hammer directly from the Thor website for £16.55 with £5.99 delivery*. If you are ordering from the US, we recommend getting it from Amazon. You can also buy the replacement heads.